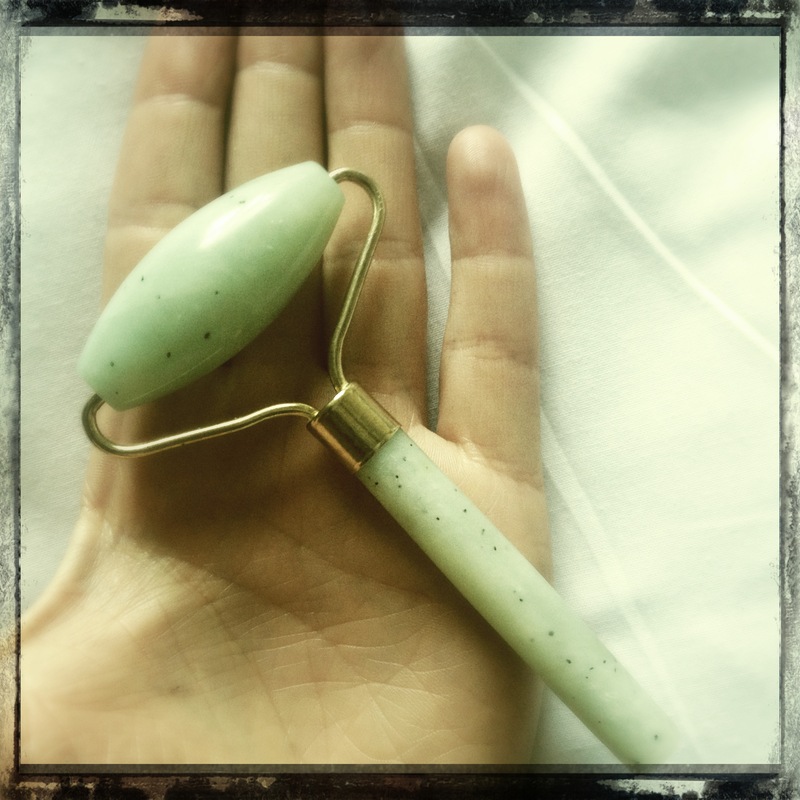 The Ying Yu Jade Roller is my new favourite beauty accessory. The brand name has now been updated to Yu Ling. The Chinese have been using jade for centuries to massage the skin, lymph channels, and muscles. 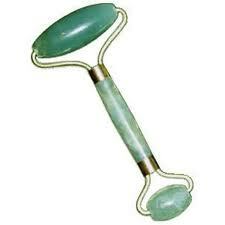 Used frequently, a jade roller is meant to tone the skin, and give facial muscles a ‘work-out’. Dark under eye circles are reduced, and toxins are removed more efficiently. Lymph nodes serve as cleaning filters – poor diet, lack of exercise, stress, headaches, shallow breathing and pollution will slow the drainage of lymph and flow of blood. Waste and toxins build up as the lymph system slows down while we sleep. The roller stimulates lymphatic drainage – ideal for anyone who suffers with puffiness or congestion on the face. The jade stone is naturally cold – and I haven’t done this as yet– but using it after it has been in the fridge is highly recommended. I suffer with congestion from time to time across my chin – I am constantly being told – and am constantly telling myself – that this is related to hormones or stress. I wondered if the jade roller could make a difference for me in terms of clearing that congestion. Toxins build up and gather in the chin and jaw region, and the rolling action around these areas help to remove those toxins more efficiently. A recent dry blood test showed that my lymphatic system is sluggish. The majority of people apparently do have a sluggish lymphatic system. A body brush is a great way to help this – every morning before bath or shower – but in terms of the face, I’m hoping that the jade roller is going to get my lymphatic system moving efficiently. The jade roller is helpful for headaches, hangovers, and sinus problems – both for painful sinus’ and sinus congestion. I have had congested sinus’ for as long as I can remember. My father has the same issue, he may well be receiving the jade roller as a Christmas gift! Paolo Lai, who I have regular reflexology with, uses these jade rollers in his facial lifting massage. If you aren’t used to facial massage, you may experience tenderness when using a roller, this is completely normal, as is redness – which shows that it is working – but always be gentle. It doesn’t hurt me in the slightest, I could use it for hours! I do however, feel a little tenderness along my sinus’. As demonstrated in the video, outwards and upwards is the best way to work the roller across the face and neck, in terms of removing toxins and fluid from the face. Outwards from the nose, upwards on the neck, and outwards from the chin along the jaw line. I have been the using the roller with a face oil, it is absolutely fine to use a roller on clean and dry skin. Paolo uses rosehip oil in his facial massage, and I have been using ARK Skincare’s ‘Firming Serum’, or an Eve Taylor Face Oil. Use once a day, twice a day – whatever works best for you. I would recommend the medium roller. The other options are – double ended (as shown below) – and small. Apparently the bigger the better in terms of a roller, to get the blood flowing. If hungover, or feeling tender, run the roller up and down the back of the neck immediately after removing it from the fridge. Yes get real jade, it’s the healing properties of Jade that are important. I haven’t tried the rose but as Cult Beauty only have the single roller (the same one as mine) in the Jade, I would go for that one. It’s an investment, but it’s one that you can use every day and won’t run out like a face cream. Get the single roller, the other one’s extra price isn’t worth it. Use code ‘UNLOCK’ at checkout for 15% off before midnight 1st May. I hope you love it. Thank you so much Susie! I want to share that I found this Ying Yu website selling jade rollers for slightly cheaper and located in US. I got somewhat confused like did Cult Beauty get their stock from them and that Ying Yu is the brand name? I just read your review and am really interested in purchasing one of these rollers. Please tell me, do you know the difference between the Jade Roller and the Rose Quartz Roller? Both are on Cult Beauty. Hi thanks for your review have been looking at this for awhile now, have a question do you think the slim cera will be the same as this but of course much much more expensive?? Thanks.